This week was all about the miles…recovery miles that is! With just finishing the marathon last weekend, an easy week was just what I needed. Monday to Wednesday – I told myself that I was taking these days “off” and just run my daily mile. Monday’s after the Marathon mile was the toughest and I was back to a normal gait by Wednesday. I took it super slow and easy. Thursday – By today, I was itching to run again. I was so glad I had taken those “rest” days because I felt really good for this run. I met Christine and Katie for a 4 miler. The weather seemed less than perfect, cold and rainy, but we made the most of it! I actually don’t mind running in the rain. We had a super run! Katie surprised the heck out of me too! She uses intervals for her long runs to help with her breathing, but she had stopped doing them on her weekly runs. We were running along and it wasn’t until mile one that I realized we hadn’t stopped. I gave her a big ol’ smack when I realized it! It was a love tap! 🙂 I’m super proud of her! Saturday – Katie and Nathan were running long on Saturday so a few of us joined them to get a few miles in. I thought I’d maybe run 3-4 miles, but ended up running 5 miles. It was super humid! I had a hard time finding a comfortable pace. By mile 3, it clicked and we stayed the exact same pace for the next 2 miles. 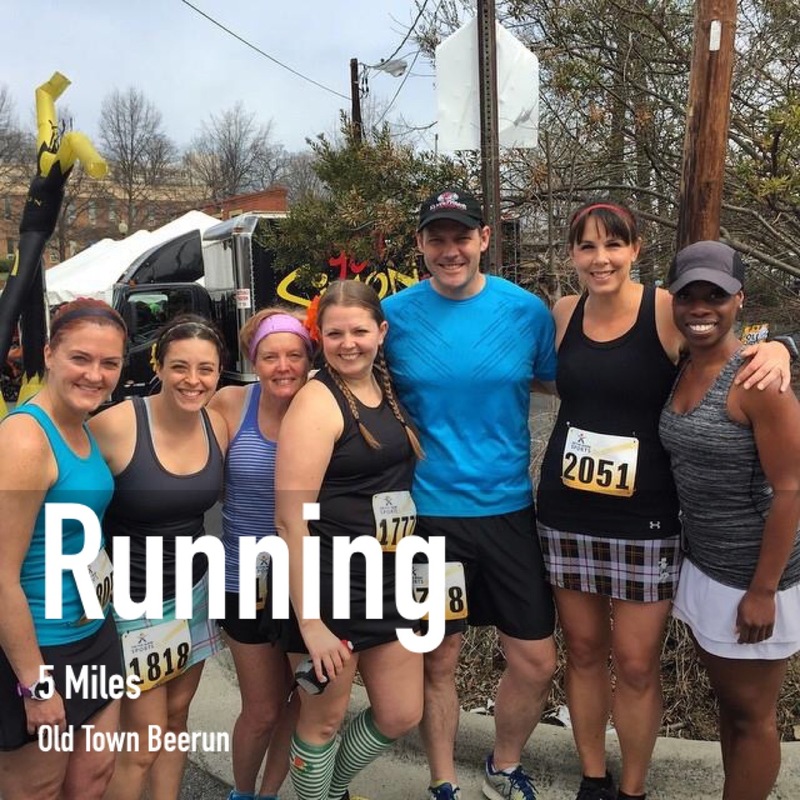 Sunday – The 15th annual Old Town Beerun, the rite of Spring in Greensboro. This yearly race is when you know that Spring has come! We lucked out this year with amazing weather. The last two years were freezing cold! It was great to see a lot of friends out there and fellow Tobacco Road Marathoners too. No racing for me yet. We ran this at what I call “beer drinking pace”. We just enjoyed the course (as much as you can! It’s hilly!) and just ran and chatted for the 5 miles. We had a great time at the post race party! I got to stop by the Elite Performance Chiropractic Table and Jeremy did some hip adjustments and some good IT band and hip flexor stretches. I feel like a million bucks! I’ll going to head back to him in 2 weeks to get another adjustment/stretch. I’m happy with that! I was shooting for 15-16 for the week. How did your week go? Training going well? Any races coming up? Need some motivation? Check out other #MotivateME Monday posts here. Go you!! That’s awesome!! I’ll be cheering you on! I’ve done it after every half and marathon and I think it helps me. Breaks up all that lactic acid and gets it moving. It helps with my recovery 100%! Oh thanks!! Have a super week!! Really nice post marathon week of running! Impressive. Are you signed up for another?! Not yet. lol I have two halfs in April so I’m just keeping my miles up for those. Then the rest of the summer is 5 and 10k’s just to keep me motivated. I haven’t figured out my Fall plan yet. Still debating.